A mix of combat tweaks and a "lossless" defeat system. The tweaks are supposed to make the combat more challenging and punishing, without being rage inducing. 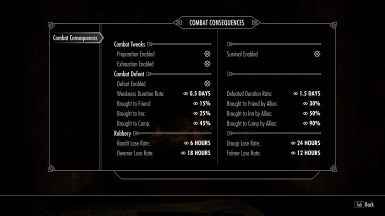 Combat Consequences is focused on making small changes to make combat more engaging, challenging, and punishing, all without making combat rage-inducing. Including changing how damage scales with the game difficulty setting, changing potion strength and duration based on the scenario, and changing how much damage is taken and given based on health and stamina percentages. It also adds a Defeat system ala Death Alternative, but is completely lossless. Any items lost through defeat can be reclaimed at a later point, so you can use your Daedric artifacts without worry. I would also recommend a mod like Mortal Enemies, and a dodge mod like TK Dodge to compliment this mod. This mod can be installed at any time, but preferably out of combat. It can be uninstalled if you aren't under the Defeated or Weakened effects, and aren't wearing any bandages added by this mod. The Difficulty Game Rules have been changed to make them more realistic, ie the player and enemies will deal approximately the same amount of damage. Increasing the difficulty makes the player and enemies deal more damage, and vice versa. The difficulty slider now represents how many mistakes you can make before losing. At Novice difficulty, it likely will take a few swings with a warhammer to down either you or enemies, while at Adept and higher, you can't make a mistake when strafing battle-axe wielding bandit chiefs. Their are a few small game-play combat tweaks to make combat more engaging. These are Preparation, Survival, and Exhaustion. These can all be disabled and enabled at whim in the MCM. Preparation changes how powerful potions and self-cast spells are, depending on the scenario. ﻿In combat, the duration and magnitude of beneficial effects are halved. Crouching and staying still negates this. So, you have to decide what potions to use before you enter combat, because when you're in combat, they'll be worthless. It also partially prevents restoration spells from making the player near-invulnerable. Survival changes how much damage you take depending on your health percentage. The more damaged you are, the less damage you take, allowing you to survive in long drawn out and tense battles, and reducing the chance of being one-shot. It also softens the impact of the Preparation and Defeat systems. Exhaustion simply changes how much damage physical weapons do, based on your stamina percentage. The lower your stamina, the less damage you'll do. Defeat is the most complex part of this mod, but is still fairly simple. With Combat Defeat enabled, when your health reaches 0, you won't die, but will start bleeding out. When you start bleeding-out, you have a single chance to Rally and get up to continue fighting in a weakened state, or to Surrender and hope your allies will take you to a safe location. Rallying will completely restore your health, but will apply a Weakened debuff. The debuff will last 12 hours after being knocked down once, and will decrease the effectiveness of your weapons, spells, and armor by 10%. Being knocked down multiple times will increase the duration and the strength of the debuff, eventually halving their effectiveness. The chance to successfully rally is dependent purely on your Level, with solo players above level 50 being guaranteed to rally, and players with followers above level 25 being guaranteed to rally. Werewolves, Vampire Lords, and other non-human transformations will be guaranteed to rally. Surrendering, or failing to rally and blacking out, will cause a few things to happen, depending on the state of your allies. If you don't have any followers, or if they're bleeding out or dead, you have a chance to be Robbed. You will then be thrown out of the dungeon, either directly outside or at a nearby location. There is a chance you will be found and brought to a nearby Camp, Inn, or the House of a friend. If you chose to surrender, then you will be brought back to the last bed you slept at. The chances of being brought to one of the other three locations are increased if you have followers with you. Additionally, you will have the Defeated debuff applied. This is an incredibly severe debuff, slowing your character, and making potions, spells, and weapons essentially useless. It is also set to last 36 hours after you wake up. Being knocked out multiple times will increase this duration. There are a few quest-specific areas that will automatically rally you without applying any debuffs; Sovngarde, Dustman's Cairn, Snow Veil Sanctum are a few examples. So you can go through most quests without worrying about being transported half-way across the province when you have a quest follower with you. Combat Defeat can be enabled and disabled in the MCM at any time. After blacking out or surrendering your game play will likely slow for some time. You will have to wait out the Defeated debuff, or buy or make Laudanum, which will shorten the duration of the debuff by a day, down to 12 hours. Laudanum can likely be bought from Innkeepers and Apothecaries, or can be made at cooking pot with some Ale and some uncommon ingredients, or with a particular potent sap. If you have to travel before the debuff wears off, it will be worth making some Bandages. Arm and head bandages can be crafted at a tanning rack with linen wraps or bloody rags. They are also given to you if you are brought to a Camp, Inn, or a Friend's House. These bandages increase your Health, Magicka, and Stamina regeneration, but only if you are particularly weakened, ie less than 50 in the appropriate attribute. If you wake up at an Inn or a Friend's House, you will be given bandages, a fresh set of clothes, and a bed to rest in. You will also be able to ask your friend or the innkeeper for food if all of yours was stolen. Keep in mind, once you leave the Inn or House, they will assume you're well enough to look after yourself, and you'll forfeit the free meals and bed. Once you've gone through all this, you should look to recovering any stolen gear. 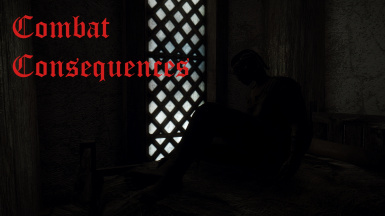 If you are unlucky enough to have your gear stolen, after blacking out or surrendering, you will want to return to the dungeon that defeated you. What items are stolen are dependent on what group of enemies defeated you, either Humanoids (Bandits, Warlocks, etc), Draugr, Dwarven Automatons, or Falmer. A small part of your gear is Lost after some time, depending on the group: 6 hours for Humanoids, 12 hours for Falmer, 18 hours for Automatons, and 24 hours for Draugr. If you return quickly enough, you should find your items on either the enemy that defeated you, or in the end chest of the dungeon. If you fail to return quickly enough, or if another group of the same type of enemies defeat you, then some or all of your gear will be Lost. Once your items are lost, you won't be able to recover them from the original dungeon, as it will have been sold off, or taken to other locations. So, to recover lost gear, you will have to go clear other dungeons of the same type, ie Bandit Hideouts, Nordic Ruins, etc. So, you might lose your uber-enchanted sword after being defeated in White River Watch, but you might find it in Redoran's Retreat or another bandit hideout. Of course, you will need to find another sword in the mean time.